My Outlaw Cousin – John Wesley Hardin -This Apple Fell Far From The Tree! A few months ago one of my cousins and I were having a conversation about the Hughes/Hayes family history. We were discussing how we had diverse characters that made up that history. Not only do we have Revolutionary War heroes, pioneers and indentured servants but we have whiskey makers, bigamists and outlaws. Last year I had discovered that the Outlaw part was more than just an inside joke about one of our cousins. John Wesley Hardin was one of the West’s most vicious and notorious gunfighters and outlaw. He was also my 2nd cousin 3x removed. He was the son of James Gibson “Gip” Hardin who was a Methodist Preacher. He was named after the founder of the Methodist Denomination, John Wesley. 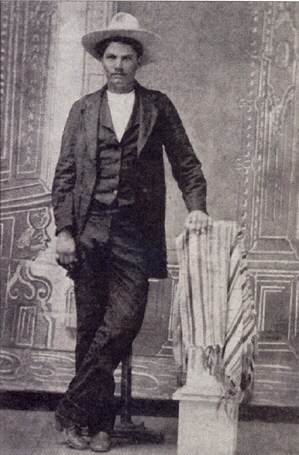 John Wesley Hardin was born May 26, 1853 in Bonham Texas. In his autobiography John states that he was 15 years old the first time he killed a man. Over the course of his life he killed approximately 42 men, one just for snoring! He was killed August 19, 1895 while in a Saloon in El Paso, TX. 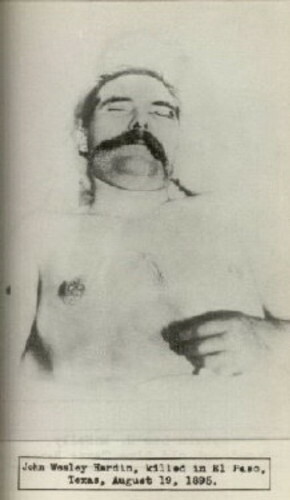 Picture taken after his death. If I were to write about all the things John Wesley had done it would fill a book. As a matter of fact it has filled several books. If you would like to read more about him, just Google his name and there will be plenty of information about him. It makes one wonder how this young man of whom people have said “had no soul and showed no remorse for what he had done” could descend from men of true character and virtue. As stated above his father was a Methodist Preacher. His Grandfather, Benjamin P. Hardin, was the Justice of the Peace and 1st Sheriff of Wayne County, TN. He was also a General Assemblyman for the State of Tennessee and a founder of Wayne County, TN. 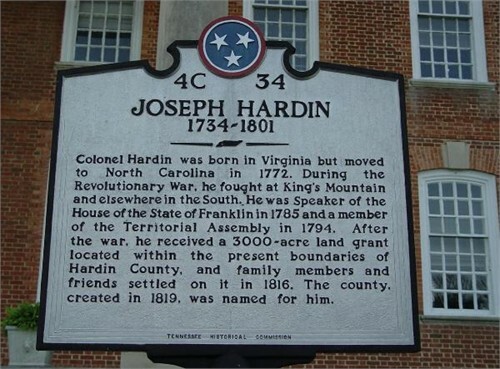 I think the one of the most interesting facts about him is that he was the Great Grandson of Revolutionary War hero Colonel Joseph Hardin, who was a legislator from North Carolina, the “lost” State of Franklin, and the Southwest Territory before its statehood as Tennessee. He was a signer of the Tryon Resolves, an Assemblyman for the North Carolina Colony, a pioneer, a Patriot and a Patriarch. I guess John Wesley Hardin is living proof that sometimes the apple does fall far from the tree!